[0:01] <slymatt> I'm trying to get humidity/temp sensor working I'm using a dht11 any idea? [0:03] <[Ex0r]> No I don't, sorry. I'm trying to figure a solution out myself. [0:13] <ShorTie> oh blaa to you, lol. [0:16] <rikkib> What value pullup are you using? [0:16] <rikkib> Do you have a bypass cap on the supply? [0:25] <[Ex0r]> hmm, do the GPIO pins work on standby ? [0:25] <clever> [Ex0r]: bcm2835 or avr? [0:26] <cousteau> is the USB port controlled by software, or is there some hardware controlling it? [0:32] <clever> what happens if you hit the button while its already on?, reset! [0:34] <[Ex0r]> so you can do it right from gpio without using the reset jumpers? [0:34] <[Ex0r]> does it work the same way ? [0:35] <[Ex0r]> oh, gotcha. is it a specific pin? [0:35] <[Ex0r]> k, that helps. [0:36] <[Ex0r]> was going to have the button send a shutdown -h now command via gpio on press, than I can have that same button turn it back on when its halted ? 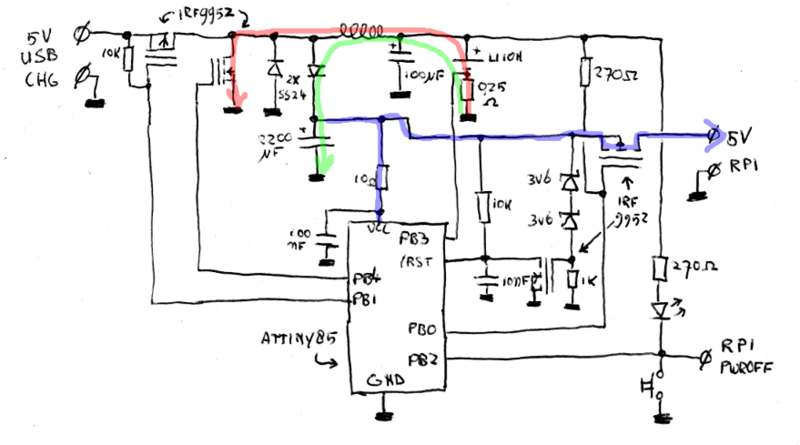 [0:41] <[Ex0r]> how do you program the avr ? [0:43] <[Ex0r]> are these your plans or just plans you followed ? [0:45] <[Ex0r]> clever- does that connect to two gpio pins on the pi ? [0:50] <[Ex0r]> yeah but isnt the main pi supply source via the micro usb plug ? [0:55] <clever> [Ex0r]: what is the 3rd pi even doing? [0:56] <[Ex0r]> clever- its a backup ? [0:58] <Xark> rikkib: What do you think of the RPI "compute module"? Will that be handy for any of your stuff? [0:59] <[Ex0r]> rikkib- powered by pi ? [1:00] <[Ex0r]> are they the rpi cameras ? [1:01] <chod> three cams on a pi and its doing all the web stuff also ? [1:02] <[Ex0r]> what software are you using ? [1:03] <[Ex0r]> howd you caption the videos? [1:13] <rikkib> Xark, Looks interesting... I have sodimm form factor boards here but never had the mother board to put them in... Now defunct. [5:30] <[Ex0r]> am i able to designate what each pin does ? (with the exception of 5v and gnd), or are there specific gpio pins to do specific things ? [7:04] <AlecksG> raspberrypifan, How much experience do you have with linux? [7:04] <raspberrypifan> enough for most things why? [7:06] <AlecksG> raspberrypifan, does that camera have linux support? [7:07] <AlecksG> Also, what do you want to do with this? You say you want to "connect" them. Connecting them should be as simple as plugging them in. [7:15] <AlecksG> rikkib, did you have to reduce the input quality? [7:17] <AlecksG> rikkib, what refresh rate are those running? [10:53] <raynerd> shiftplusone - you about? [10:54] <raynerd> Anyone know how to refresh the NTP server - I`ve put in the ip but the time and date isn`t updating!! [11:01] <raynerd> I`m just rebooting. [11:01] <raynerd> I`ve put the school NTP server in and it just doesn`t seem to pick up the correct time and date!! [11:16] <raynerd> any more thoughts? [11:19] <winlu> so it does not show any more error messages? [11:20] <rikkib> you can ping 172.29.16.1? [11:26] <raynerd> How do you mean? [11:28] <raynerd> "no manual entry for ntpdate"
[11:30] <raynerd> This is really driving me nuts. The weather station software won`t run if I don`t get the correct time! [11:32] <raynerd> what is ntpdate - is this different? [11:33] <raynerd> What have i been trying to usE? [11:39] <raynerd> OK, so he line under says: 28th Aprint 10:36 ntpdate !! Hurray... but the system clock in the bottom right is still showing wrong! [11:42] <raynerd> the 1 * * * * correct? [11:46] <Coffe> if you are going to change to use ntpdate yes. but why make own solution when ntpd could fix it for you ? [11:47] <raynerd> Hi Coffe - I just spent the hour with rikkib trying to get ntpd to update.. but ntpdate seemsto have done the trick! [11:48] <raynerd> then I`ve got ntpdate running in cron.... correct? [11:51] <raynerd> in rc.local I have /home/pi/PIGPIO/pigpiod and this seems to run the deamon pigpiod however, I also have a libne, python /home/AirPi/airpi.py & yet this line doesn`t run! [11:53] <raynerd> I could run it in cron... but I wanted to run at boot. [11:53] <Coffe> raynerd: what is the goal of the project ? [11:55] <Coffe> i dont know what airpy is . [11:55] <rikkib> who wrote the daemon? [11:56] <raynerd> pigpio is quite a popular gpio plugin... I`ve used it before at boot and it has worked! [11:58] <raynerd> Hummm... we had this running just fine last month before the pi crashed! [12:03] <raynerd> why does airpi.py need to run as a deamon?? [12:04] <Coffe> ray it might work.. but its better to do it porpper right ? [12:04] <raynerd> I know... just don`t have time and then it`ll be another week. Thought I`d get it outside today! [12:05] <Coffe> try to change starting order ..
[12:05] <Coffe> but if you strt them up manualy it will work untill next reboot. [12:05] <raynerd> working great manually! [12:09] <raynerd> is /home/pi the full path ? [12:18] <raynerd> Nothing seems to be running from rc.local and ti worked fine before!!! [12:28] <raynerd> Is there a boot log to show why this isn`t starting in rc.local ??? [12:42] <raynerd> I know whats happening!! [12:42] <raynerd> I just can`t remember how! [12:47] <raynerd> godronDragon, you abut? [13:34] <kevinprince> anyone got any ideas why arduino serial output to a Pi is being different to my mac, same code on both. Im getting my initial debug messages in setup but non of the loop ones. [13:53] <Bhaal> Anyone know if "joan" from the rpi forums is in here? [13:56] <gordonDrogon> raynerd, what sort of assistance? [14:05] <raynerd> gordonDrogon - just the man!!!!! [14:05] <raynerd> Many weeks ago, you showed me how to start my airpi.py and pigpiod at boot in rc.local! [14:08] <raynerd> I think that boots up OK though! [14:09] <raynerd> OK.. let me try that now. [14:09] <gordonDrogon> I don't recall. [14:10] <gordonDrogon> just to make sure you get the right one. [14:10] <raynerd> shiftplusone !! YES !!! [14:11] <raynerd> I`ve installed everything AND AND AND put the weather station on the roof! [14:12] <ShiftPlusOne2> I'd put debug messages in rc.local and log everything to a file to see where it fails. [14:14] <gordonDrogon> Bhaal, me. well one. [14:16] <gordonDrogon> Bhaal, sure. good luck. [14:16] <gordonDrogon> the last time I looked, the adafruit one was basically broken - it worked, but for the wrong reasons. [14:16] <Bhaal> gordonDrogon: Does it work much better? And url please? [14:16] <gordonDrogon> mine works - it's not 100% - it can never be due to the timing constraints. [14:17] <gordonDrogon> do you use wiringPi? [14:17] <raynerd> when in the boot sequence does rc.local run? [14:17] <Bhaal> uh, no... Is that hardware? [14:17] <gordonDrogon> Bhaal, it's a Pi GPIO driver written in C.
[14:17] <raynerd> No... it still isn`t running! [14:17] <gordonDrogon> raynerd, put a bunch of echo commands in rc.local to see if you can work out where/why. [14:17] <raynerd> will there be any log to show why rc.local has failed or at least see if it tried to run? [14:18] <gordonDrogon> Bhaal, wiringPi is - the 'bcm2835" one is someone elses. [14:18] <gordonDrogon> raynerd, yes- echo - as in "echo got to here" and so on. [14:18] <gordonDrogon> to get the result of the last command. this is fundamentally basic stuff here. [14:18] <Bhaal> gordonDrogon: Do I have to strip the bcm2835 driver out first? [14:18] <gordonDrogon> then you run rc.local manually, then reboot it. [14:19] <ShiftPlusOne2> also note that when rc.local runs, you don't have all of your environment variables set yet, so it may cause some programs to fail. [14:19] <raynerd> shiftplusone2 - literally that line. [14:20] <ShiftPlusOne2> raynerd, what is this pigpiod thing... what's it running for? [14:21] <raynerd> It is the booting up of airpi.py that doesn`t seem to be loading. [14:22] <ShiftPlusOne2> how come there's no & at the end of the piogpiod line then? [14:22] <ShiftPlusOne2> does airpy.py RELY on pigipod ? [14:23] <[Ex0r]> do the gpio pins output at 3.3v ? [14:23] <raynerd> airpi does totally or it won`t run. [14:23] <ShiftPlusOne2> raynerd, so is it possible that pigpiod hasn't done whatever it is it does when airpy launches? [14:24] <gordonDrogon> raynerd, I'd probably never tie 2 lines together in a bash script. [14:24] <gordonDrogon> maybe you do need a sleep 1 after starting pig poid ..
[14:25] <Bhaal> gordonDrogon: Ok, its installed, now is there anything pre-written for the DHT22? [14:25] <raynerd> does that even make sense? [14:26] <gordonDrogon> Bhaal, look for rht03.c - that's more or less the same sensor. you'll need to change the pin numbers to suit. [14:26] <ShiftPlusOne2> I think this all depends on pigpiod's behaviour. Does it self-background? If so, does it do so AFTER it has done the basic init stuff it needs to or does it just run in the background straight away? [14:26] <gordonDrogon> [Ex0r], family friendly channel. abreviations not allowed. [14:27] <raynerd> ShiftPlusOne2 - only reason I think it is running, is because I don`t need to start it. [14:27] <Bhaal> gordonDrogon: pin number as in GPIO pin the DHT22 is connected to? [14:27] <gordonDrogon> [Ex0r], most LEDs are 1.8 to 2.2v there is no problems powering them from the Pi. [14:28] <gordonDrogon> [Ex0r], what LED are you using? the current limit on the pi is 15mA. [14:28] <gordonDrogon> Bhaal, did you change the pin, or connect it to the right one? the example uses wiringPi pin 0 by default which is bcm_gpio pin 17. [14:29] <gordonDrogon> and run them off 5v. [14:29] <Bhaal> Ohhhh, wiringpi pin .. ok..
[14:29] <ShiftPlusOne2> ah, pigpiod doesn't seem to be on github and I am too lazy to download a zip file to look at their source code. [14:29] <Bhaal> gordonDrogon: diagram to show which corresponds with which? [14:30] <gordonDrogon> [Ex0r], you only get 15mA off the GPIO pins. [14:30] <gordonDrogon> ShiftPlusOne2, ah, intersting. she never gave out the source originally. [14:31] <gordonDrogon> [Ex0r], oh - any small 5mm or 3mm LED usually. [14:31] <raynerd> Well I`m gutted. [14:31] <raynerd> It worked fine last time and I never had any hastle getting it to start from boot! [14:32] <raynerd> Caretake has spent hours sticking up the weather station case! [14:32] <Bhaal> gordonDrogon: You're full of awesome! [14:33] <[Ex0r]> gordonDrogon- http://www.radioshack.com/product/index.jsp?productId=2102850 Would that one work ? [14:33] <ShiftPlusOne2> gordonDrogon, I am not too familiar with fork(). I don't quite understand the source file. By my reading, it forks off straight away, so things might not be initialized when he runs airpy.py, but I am not sure. [14:34] <ShiftPlusOne2> raynerd, so what happens when you put a sleep in there? [14:34] <Bhaal> gordonDrogon: Oh wait, there it is.... I'm guessing there is some kind of wait going on? sync? [14:35] <gordonDrogon> [Ex0r], probably - stick a 220Ω resistor in series with it and see what happens ... it may be a bit dimmer than it's meant to be, but it should light up. [14:35] <ShiftPlusOne2> raynerd, I have no idea why you decided to use pygpiod in the first place. It doesn't seem to offer anything for your use case. [14:35] <gordonDrogon> Bhaal, the timing is somewhat challenging for that sensor on the Pi - I actually have some improved code for it, but not pushed it up yet - not enough time to do more testing - sorry. [14:36] <gordonDrogon> [Ex0r], yes - it'll just be dimmer. [14:37] <ShiftPlusOne2> raynerd, can you pastebin your rc.local in the form that 'should' work? [14:38] <gordonDrogon> [Ex0r], you should be able to buy generic LEds online where you are. [14:40] <gordonDrogon> [Ex0r], ok. so you need an LED and a resistor. [14:41] <Bhaal> gordonDrogon: Ok, I used the DHT22 sensor coz I was able to drive down the road and buy one... What's the better sensor to buy for the RPi? [14:43] <raynerd> shiftplusone2 - I will be it`ll be an hour. Just walked into class! [14:44] <[Ex0r]> gordonDrogon- hmm, you said a 220hm resistor i what I need? [14:47] <Bhaal> gordonDrogon: I am finding I can be sitting here waiting quite a while, like 30 seconds before it gets a reading, is that unusual? [14:49] <gordonDrogon> Bhaal, no. it just means it's mis-read many times. [14:49] <gordonDrogon> Bhaal, the data sheet says you should only try to read it once every 2 seconds too. [14:49] <gordonDrogon> [Ex0r], I'm just guessing at 220 ohms - however it's a safe value. [14:50] <gordonDrogon> [Ex0r], to calculate the right one would need to know the full specification of the LED, but 220 or 330 are safe for most LEDs. [14:50] <Bhaal> gordonDrogon: Ah, so delay() should be 2000? [14:50] <gordonDrogon> Bhaal, no - the driver itself does the delay for you. [14:50] <gordonDrogon> Bhaal, if you read it too fast it just returns the last value. [14:51] <gordonDrogon> so it doesn't print becaus it's not changed. [14:51] <Bhaal> So what is the delay in the rht03.c for? [14:51] <gordonDrogon> seemed like a good idea at the time. [14:51] <gordonDrogon> brb - call. [14:56] <Bhaal> gordonDrogon: I've got the DHT22 hanging off about 1.5mtrs of flat 4 core phone cable, this shouldn't be a problem of any kind right? [14:57] <Bhaal> gordonDrogon: ie: is getting 30secs to 1min worth of mis-reads quite normal? [15:12] <Rootza> Anybody know anywhere that sells the raspberrypi using bitcoin? [15:12] <[Saint]> Bhaal: hanging such insignificant weight, such as a single DHT22, off standard 4-core tinsel cable should be perfectly fine. [15:16] <gordonDrogon> Bhaal, the timing is in the oder of 6�S - you should be OK with a cable that long. [15:17] <gordonDrogon> the sensor returns a checksum to give confidence of the data being ok.
[15:17] <gordonDrogon> when you get a timing issue the checksum is wrong. [15:18] <gregc2> Does anyone know how to fix repeating keys with a symbol scanner? I have checked voltages, settings. tried fiq updates etc... Nothing seems to fix the repeating keyboard/scanner issues I am having. Any advice would be helpful. [15:19] <gregc2> gordonDrogon, do you know of any SBC's that have decent usb subsystems other than the pi? I just want a sbc that works with this stuff. [15:21] <gordonDrogon> gregc2, sorry - I'm sticking to Pi for now. [15:22] <gordonDrogon> gregc2, people seeing it on my software said it starte when I added sound into the interpreter. [15:22] <gordonDrogon> I was not convinced myself. [15:46] <gordonDrogon> Bhaal, the issue is timing - you send a pulse then wait for a puls back - the time of the pulse back will tell you if it's a '1' or a '0'. If the Pi gets interrupted then the timing will be wring. They can work very well on arduinos where there is nothing to interrupt you. not so well in a Pi. [15:46] <gordonDrogon> Bhaal, I have some experimental code if you want to try it - it's lighter on the cpu. [15:49] <[Ex0r]> gordonDrogon- do you watch game of thrones by any chance ? [15:50] <[Ex0r]> the second part of your name is similar to a family in the series, so I figured you did. [15:51] <gordonDrogon> Drogon? it's an anagram of Gordon. [15:51] <gordonDrogon> I've been using it in my projects since 1992. [15:53] <gordonDrogon> Bhaal, sorry - I've given you the last version not the working one - bear with me. [15:55] <gordonDrogon> Bhaal, ok - if you re-do those fetches (and change the pin ;-) then it shouldn't hog the cpu. [15:55] <gordonDrogon> the read probability of success won't be any different though. [15:56] <gordonDrogon> what I have in my notes is a change to return a "confidence" value too - which is based on the time of the last successful read. [16:01] <Bhaal> gordonDrogon: It throws back a result within a couple of seconds now..
[16:02] <gordonDrogon> I know its better but on the Pi it will be really hard to get it right all the time. [16:02] <gordonDrogon> purely due to the 'economical' nature of the communications interface. [16:02] <gordonDrogon> really designed to be hooked up to a microcontroller with more precise timing ability than the Pi. [16:09] <Bhaal> gordonDrogon: "what timing?" [16:10] <gordonDrogon> timing for the maxdetect protocol that those sensors use. [16:10] <gordonDrogon> lacrymology, one line only. [16:11] <gordonDrogon> lacrymology, add it to the end of the one and only line. [16:13] <lacrymology> is it normal that it reboots whenever I plug something in the USB? isn't there hotplugging capability? [16:13] <Bhaal> gordonDrogon: So, would I be better off with that 1-wire sensor? [16:13] <gordonDrogon> lacrymology, it's .... not normal, but it often happens. [16:13] <gordonDrogon> Bhaal, I really don't know - I've not used 1w on the Pi. [16:15] <gordonDrogon> are you logged in using the init=/bin/bash way? [16:16] <gordonDrogon> if so, then you'll not have any path setup. [16:17] <gordonDrogon> no - you have a bare bones system. [16:17] <gordonDrogon> I'd turn it off, then re-image the S Dcard from scratch - unless there is data on it you need. [16:17] <gordonDrogon> Get Raspbian off the foundation website and go from there. [16:18] <Bhaal> gordonDrogon: Your help has been greatly appreciated! Thank you so much for your time! [16:18] <Bhaal> I need to go to bed now..
[16:18] <gordonDrogon> lacrymology, well - in that case, you need to do some linux command-line "stuff" to get the Pi user re-created. [16:18] <gordonDrogon> even then you'll not have any of the standard setup files, etc. [16:19] <gordonDrogon> If you have the means to download a few 100MB of SD image and copy it to the SD card then that's what I'd do. [16:20] <gordonDrogon> then enter a new root password, then type sync a few times, wait 10 seconds the power down - put the SD card back into the PC and re-edit cmdline.txt to remove the init= and give it a go. [16:20] <gordonDrogon> then you might be able to login as root with a full system. [16:21] <gordonDrogon> or as full as it was left - sounds a bit off for them to delete the 'pi' user - unless it was some media distro - raspbmc, etc. [16:45] <[Ex0r]> whats the command to set the local timezone ? [16:48] <takkie> [Ex0r]: you can set timezones with "timedatectl set-timezone ..."
[16:49] <gordonDrogon> they mean nothing either. F ? [16:49] <gordonDrogon> ah. yes. a cool Pi. [16:49] * [Saint] had to ask Google Now to do the conversion for him. [16:50] <[Saint]> Stoopid imperial measure. [16:50] <gordonDrogon> yea, I've forgotten. [16:51] <[Saint]> [Ex0r]: high for a human, sure. [16:51] <IT_Sean> Stupid metric system. [16:52] <ShiftPlusOne2> raynerd, what does the source code look like? [16:52] <[Saint]> [Ex0r]: there's no need to bring it down any. [16:52] <[Saint]> Its perfectly normal operating temperature. [16:53] <[Saint]> The way the SoC is packages, not really, no. [16:53] <IT_Sean> A heatsink would do very little. [16:54] <[Saint]> The pi will shut itself down if it gets anywhere near an unsafe operating temperature. [16:54] <[Saint]> You don't need to worry about this at all. [16:54] <[Saint]> [Ex0r]: I think you're highly mistaken. [16:54] <ShiftPlusOne2> raynerd, ah, simple. [16:54] <[Saint]> Think of the millions of embedded ARM devices out there that don;t include a heat sync. [16:54] <SirLagz> without what ? [16:55] <SirLagz> oh heat sinks. [16:55] <raynerd> ShiftPlusone2 - really??? [16:55] <[Saint]> Not only do they not include a heat sync, they are packaged in a tight plastic shell with no air flow. [16:55] <ShiftPlusOne2> raynerd, it's using a relative path, so it can't find it in the 'current' directory. [16:55] <[Saint]> [Ex0r]: think of your cellphone. [16:56] <SirLagz> [Ex0r]: 486s did. [16:56] <[Ex0r]> [Saint]- If you consider 30 young, sure. [16:56] <ShiftPlusOne2> raynerd, it's trying to open 'sensors.cfg', but can't find it, because it's not in the directory it's looking for it... in. [16:56] <[Saint]> Wow...where have you been, then? [16:57] <raynerd> ShiftPlusOne2 - how do I tell it where to look? [16:57] <IT_Sean> [Ex0r]: your raspberrypi has more in common with a mobile phone or a cable box than a PC. [16:57] <[Saint]> Its exactly a mid 00's cellphone. [16:57] <ShiftPlusOne2> raynerd, one way would be to 'cd' to the directory before running it. [16:57] <SirLagz> [Ex0r]: so you have only owned PCs newer than pentium 2s pretty much. [16:57] <ShiftPlusOne2> raynerd, yes, but that doesn't change the current working directory. [16:59] <IT_Sean> Not only does the raspi not need a heatsink, adding one will do very little, as the actual CPU is buried under the RAM. [16:59] <ShiftPlusOne2> raynerd, let me skim through the rest of the source code so that I am sure it doesn't mess around with the working directory. [16:59] <SirLagz> I seem to recall one of the Pi Devs saying that Heat Sink will actually decrease the performance of the Pi...don't quote me on that though. [16:59] <[Saint]> Actually, unless you're quite careful, adding a heat sync will retain heat. [16:59] <ShiftPlusOne2> raynerd, yeah, give that a go. (pastebin it before you reboot). [16:59] <[Saint]> SirLagz: it can, yes. [17:00] <SirLagz> hence why it's better to run the Pi 'naked' as it is, than with a Heat sink. [17:00] <ShiftPlusOne2> how the hell would it decrease performance? [17:00] <causality> ShiftPlusOne2: it can't..
[17:01] <[Saint]> TL;DR, ~200f/90C is perfectly tolerable by most electronics, they couldn;t care less - no, you don;t need a heat sync. [17:01] <raynerd> doesn`t python /home/pi/AirPi/airpi.py do the same thing? [17:01] <[Saint]> The pi will shut itself down well before that anyway...so, yeah. [17:01] <[Saint]> Its not even worth thinking about. [17:01] <SirLagz> ShiftPlusOne2: increase the heat that is sitting on the RAM chips itself ? I don't remember sorry. I'll have a dig through the forums sometime to see if I can find the quote. [17:01] <ShiftPlusOne2> raynerd, that runs the command, while the shell still stays where it is. [17:02] <[Saint]> ANY reasonably modern device will have thermal protection for the SoC. [17:02] <ShiftPlusOne2> SirLagz, ah, don't worry about it. [17:03] <SirLagz> ShiftPlusOne2: you're on the East Coast of Aus, right ? [17:03] <ShiftPlusOne2> SirLagz, last time I checked, yes. [17:03] <ShiftPlusOne2> raynerd, nuh, can I PM you. It's a tad noisy here. [17:04] <SirLagz> ShiftPlusOne2: I have a whole bunch of Analog TV tuners...and We don't have analog TV anymore lol. Any ideas on what I can use them for nowadays ? [17:04] <raynerd> ShiftPlusOne2 that would be great..
[17:04] <[Saint]> Does AU still have analogue TV? [17:05] <[Saint]> To AU, I mean. [17:05] <ShiftPlusOne2> [Saint], actually it was turned off a while back. [17:06] <[Saint]> Well, that makes me feel slightly better. [17:06] <ShiftPlusOne2> SirLagz, heh, nuh, I stopped doing the whole tv thing ages ago. [17:06] <[Saint]> Just lagging on Internet. [17:06] <[Saint]> They messed up fiber for you guys so bad. [17:07] <[Saint]> VDSL/2? Nah...fiber will save the day! [17:07] <[Saint]> It makes no sense to rollout for VDSL/2 now, sadly. [17:07] <SirLagz> VDSL or FTTP. Whatever. Just get your act together and get it done. [17:07] <[Saint]> ~10 years ago...definitely. [17:08] <[Saint]> Not now though. [17:08] <[Saint]> You're pretty much committed to fiber. [17:42] <raynerd> onto the roof! [17:42] <raynerd> @CHSweather should be tweeting soon! [17:42] <mfa298> beaky: you could possibly do it by turn a gpio on, wait a bit, turn it off, wait a bit and then repeat although that will be dependant on the OS timing accuracy. for a single 400Hz square wave you can probably also use the hardware pwm which would mean the timing is done in hardware. [17:49] <mfa298> use C and basicly do what the libs are doing along with reading the datasheets - and spend lots of time restarting the Pi when you make it crash. [18:11] <gordonDrogon> beaky, you can use the softTone module in wiringPi to generate 400Hz - however there will be a small amount of jitter. You can also use the code I put together to do it via the PWM pin - no jitter there, but it ties up the PWM pin. [18:12] <gordonDrogon> beaky, yes - the 3.5mm audio output uses both internal PWM channels. [18:13] <gordonDrogon> which has code/runes to generate tones via the Pi's PWM output. [18:23] <[Saint]> I have a tiny piezoelectric plate speaker and a raspi with the 3.5mm out snapped off. [18:24] <[Saint]> Crude CHASIS_SPK here I come. [18:24] <kevinprince> anyone got any ideas why arduino serial output to a Pi is being different to my mac, same code on both. Im getting my initial debug messages in setup but non of the loop ones. [18:24] <gordonDrogon> how is arduino connected to the Pi? [19:27] <utack> hi guys. how about android 4.4. would it work with the new open source drivers for the gpu or are there still issues ? [19:28] <utack> shiftplusone, but theoretically an accelerated android with gpu support and video decoder would be possible now? [19:33] <Talez> hey, i managed to get a apache server up and running on my PI, all working on local network so far. looking to make the server aviable via internet and maybe get a domain. considering that i'm a noob, is there some sort of tutorial that would cover this? [19:34] <shiftplusone2> Talez, just make sure that your ISP doesn't block port 80 and that you have it forwarded correctly. [19:35] <shiftplusone2> then register the domain and make it point to your IP. [19:36] <Talez> shiftplusone2: so the first thing to do is to set up some kind of port-forwarding? [19:36] <shiftplusone2> depends on your ISP and local network. [19:37] <Talez> hmmmm how can i find out more about this? [19:47] <Talez> does, like, my router have its own IP that can be accessed or how does the principle work? [19:47] <IT_Sean> It, like, yeah... should have, like, an, like, ip, like, address. ...liek. [19:47] <IT_Sean> As a device on your network, your router has an IP address, yes. [20:00] <IT_Sean> Talez: your ISP may block incoming requests on port 80. Many ISPs do on home services. [20:07] <shiftplusone2> yeah, you'll need something external to do that. [20:07] <melwyn> the best would may be to shutdown the raspi and then wake it up again with the reset switch, right? or is the shutdown-power still quite high? [20:09] <shiftplusone2> I haven't measured the halted power consumption. [20:44] <slymatt> hey guys has anyone attempted to use a dht11 humidity/temp sensor with the pi? [20:48] <slymatt> i get an error Wprogram.h no such file or directory, do i need this or is that for arduino? [21:07] <x29a> slymatt: what software/api are you trying to compile? [21:08] <x29a> and what interface does the dht11 have? [21:08] <slymatt> I'm using a raspberry pi with arduino shield bridge, I'm using qccreator and what do you mean interfacE? [21:43] <shiftplusone2> what broke now? [21:44] <shiftplusone2> ahm, dobriy den? [21:49] <shiftplusone2> haven't had a chance to work on it and am way behind schedule. [21:51] <shiftplusone2> is that site running on a pi? [21:54] <raynerd> you know over a webserver - internally only - could it act as a shared drive. [21:55] <raynerd> I.e host files and add files? [21:55] <raynerd> as in "raynerd easy" or just easy? [21:56] <shiftplusone2> do you need to share with windows computers? [21:58] <raynerd> that would stop people deleting as well. [21:58] <raynerd> client to ssh into the pi? [21:59] <slymatt> does anyone here work with cqcreator? [22:00] <raynerd> i.e no nice user interface. [22:01] <raynerd> you know I kept moaning that I havae two dead pi`s? [22:01] <raynerd> Well you personally were correct... it was the SD slot holder. [22:01] <slymatt> anyone know a quick and easy way to change a label in qt creator in code ? [22:01] <shiftplusone2> how did you fix it? [22:02] <shiftplusone2> had trouble getting the old one off or not? [22:03] <raynerd> as it happens, I was luck and just took a set of wire clipers at it. Its all top mounted and not through mounted! [22:04] <shiftplusone2> luckily it was a useless pad and it worked fine without that pin connected. [22:05] <Twinsen> Hey guys, I have a really fast internet connection(100mbps) and an external HDD attached to my raspberry. I would like a torrent client that is as fast as possible. I tried transmission, but it wasn't able to download at more than 1MB/s. Anyone know any alternatives or optimizations? [22:05] <shiftplusone2> raynerd, yup, that's a good way to do it. [22:06] <raynerd> yes, pretty cool. [22:07] <raynerd> It turns the reprap into a wireless printer and networked! [22:09] <shiftplusone2> spoiler: everybody dies... always. [22:12] <shiftplusone2> I don't think the client will make any real difference. [22:13] <Twinsen> what speeds do you manage to get? [22:21] <shiftplusone2> slymatt, qt should have a channel. [22:22] <shiftplusone2> beaky, you need an ADC. The pi doesn't have analogue inputs. [22:23] <slymatt> i find raspberry pi to arduino bridge shield is good! [22:28] <shiftplusone2> If you're doing this for fun, just pick whatever ADC is supported by your library of choice. If you actually want a scope, then you're doing it wrong. [22:39] <shiftplusone2> I think it was designed with 20mA in mind, but I am sure you can get way more from there without any hassle. What range were you thinking of? [22:40] <shiftplusone2> note that it doesn't actually take 700mA to power the pi. [22:42] <IT_Sean> rikkib: I'd listen to shiftplusone on this... he's done more power related testing than I care to remember having listened to. [22:42] <shiftplusone2> actually, I think rikkib would've done more than me. 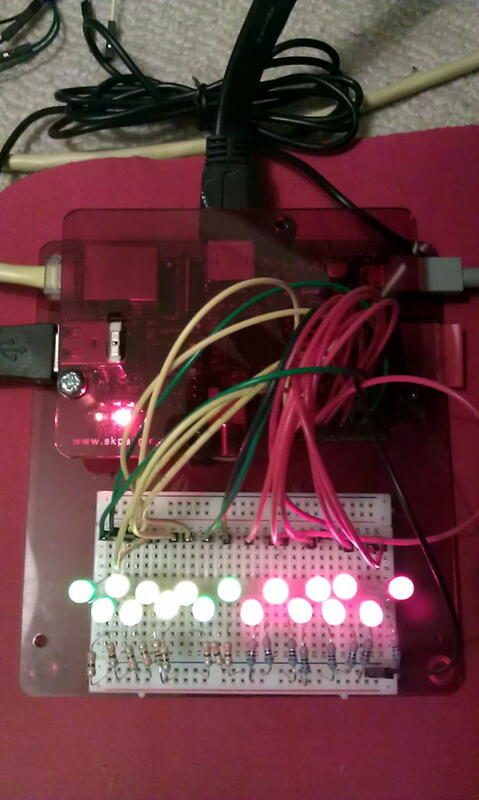 [22:42] <shiftplusone2> rikkib, is that with fancy gpio gizmos and usb devices? [22:45] <shiftplusone2> Shame that my meter is only for 400mA. While I am certain that I'd measure about 350mA with nothing plugged in, I am not certain enough to risk the fuse. [22:51] <shiftplusone2> now then... to sniff out what blew up. [23:07] <shiftplusone2> lol... there's a... I don't know what to call it. Just a loose casing of a cap inside.... blew clean off. [23:07] <Caelum> Hello, does the rpi have an internal usb header or only the ports? [23:11] <Caelum> ok, will research those, thank you! [23:23] <shiftplusone2> I prefer my explosions to be intentional, not random. [23:24] <shiftplusone2> I'll just... pop that back on and... there we go... good as new. [23:24] <shiftplusone2> usually it's quite boring... a little puff of smoke and that's it. [23:25] <shiftplusone2> rikkib, would it be a good idea to make sure there's nothing wrong with the board... or the next one might just blow up again? [23:27] <rikkib> Do you have a veriac? [23:34] <shiftplusone2> Why not just probe the voltages with a multimeter to make sure it's all operating as it should? [23:34] <shiftplusone2> ah great, out of solder wick, so I guess this repair will have to wait. [23:35] <rikkib> temp controlled iron? [23:35] <shiftplusone2> but there are many pads and on opposite sides of the board, I won't be able to keep all the solder molten. [23:35] <rikkib> do you normally do cct repair? [23:37] <shiftplusone2> Ah, I know my way around. I've learned not to attempt things in frustration and without proper tools, so I am leaving it until I get the solder wick. [23:40] <shiftplusone2> not sure I can do that without botching it. [23:41] <shiftplusone2> loose is like "a loose knot"
[23:42] <shiftplusone2> Triffid_Hunter, yeah, I found that mildly amusing. Haven't seen that before either. [23:56] <shiftplusone2> violins are awesome. Even when someone is just tuning one it sounds awesome.